The American Freedom Party (formerly the American Third Position Party or A3P) is a Third Position American political party that promotes white nationalism. In November 2009 it filed papers to get on a ballot in California, and was launched in January 2010. According to the Southern Poverty Law Center, it was created to channel the right-wing populist resentment engendered by the financial crisis of 2007–2010 and the policies of the Obama administration. The party chairman is Los Angeles attorney William Daniel Johnson. Long Beach State University professor of psychology Kevin B. MacDonald has been named one of the eight party Directors, and is also a principal contributor to The Occidental Quarterly where he has contributed articles claiming that a suite of traits that he attributes to Jews, including higher-than-average verbal intelligence and ethnocentricism, have eugenically and culturally evolved to enhance the ability of Jews to out-compete non-Jews for resources. MacDonald believes this advantage has been used by a number of Jews to advance Jewish group interests and end potential antisemitism by either deliberately or inadvertently undermining the power and self-confidence of the European-derived majorities in the Western world. A 2006 article in The Nation magazine reports that MacDonald's 2004 Understanding Jewish Influence: A Study in Ethnic Activism "has turned MacDonald into a celebrity within white nationalist and neo-Nazi circles." Writing in the Journal of Church and State, Professor George Michael noted that MacDonald's work "has been well received by those in the racialist right, as it amounts to a theoretically sophisticated justification for anti-Semitism," and that on the far right MacDonald "has attained a near reverential status and is generally considered beyond reproach". 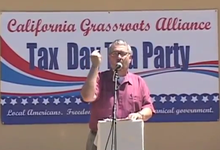 William Johnson, Chairman of A3P, speaking at a Tea Party rally. New Hampshire state party chairman Ryan Murdough ran in the Republican primary for a seat representing the Eighth District of the Grafton County delegation to the New Hampshire House of Representatives, but he was refused support by the Republican party, which called him a "despicable racist". He placed fifth out of five candidates in the Republican primary, garnering 296 votes (11%). Murdough was the National Political Director for the National Socialist American Labor Party, a party which espouses Nazi beliefs. In November 2009 the American Third Position Party filed papers with the office of the Secretary of State of California, hoping to become a fully ballot-accessible party by the time of the June 2010 California primary election. However, the party failed to qualify and did not get on the 2010 ballot in California or any other state. The party received enough signatures to get Harry Bertram on the ballot for the 2011 West Virginia gubernatorial special election. Bertram's campaign ran a television ad emphasizing his desire to advance the interests of white Americans. Bertram was soundly defeated in the election, coming in last place out of 5 candidates on the ballot and netting only 1,111 votes; less than 0.4 percent of the total. In January 2012, the American Third Position Party announced Merlin Miller as its presidential nominee for the 2012 presidential election. Virginia Abernethy was announced as his running mate. According to an AmericanFreedomUnion.com posting, they obtained ballot access in Colorado, New Jersey, and Tennessee. Kenn Gividen was nominated by the party as its candidate for president and Bob Whitaker was nominated for vice president on March 2015. Gividen resigned from the nomination on 26 July 2015 after holding the role for 4 months; Whitaker then stepped into the role as candidate for president. Whitaker, best known for coining the phrase “White Genocide” to describe the declining percentage of whites in the United States, gave up the nomination on 7 April 2016 in protest over the party's growing support for Donald Trump. In early February 2012 members of the hacker group Anonymous released statements claiming to have hacked the website of the party and various forums and email accounts connected with the group, including that of Jamie Kelso, the website's operator. The front page of the party's website was defaced with #OpBlitzkrieg (the designated name used in January 2012 for a series of Anonymous cyber-attacks on German Neo-Nazi websites) and private information about the organization's members was released. On February 1, 2013, the party's website carried an announcement that the party was changing its name to "American Freedom Party", although the values and mission would remain unchanged. ^ "A3P Launch Marked by Tabletop Outreach". American Third Position. Archived from the original on March 14, 2010. Retrieved January 13, 2010. ^ a b "Ron Paul campaign denies white supremacist ties alleged by Anonymous". Yahoo! News. February 3, 2012. Retrieved February 18, 2012. ^ Larry Keller. "New White Supremacist Party has Mass Electoral Ambitions". Southern Poverty Law Center. Retrieved February 3, 2012. ^ Alison Knezevich (June 15, 2011). "Labor changing mind on Tomblin?". The Charleston Gazette. Archived from the original on October 4, 2013. ^ Sanya Khetani (February 1, 2012). "Anonymous Has Revealed The British National Party's Links To An American White Supremacist Group". Business Insider. Archived from the original on July 1, 2012. Retrieved February 18, 2012. ^ "American Third Position". Web.archive.org. Archived from the original on January 23, 2010. Retrieved January 30, 2016. ^ Southern Poverty Law Center (Spring 2010). "Prof Has New Job Running Racist Political Party: Academic Anti-Semitism". Archived from the original on April 24, 2010. Retrieved April 28, 2010. ^ "Controversial CSULB professor MacDonald is director of new political party". Presstelegram.com. Archived from the original on July 28, 2013. Retrieved January 30, 2016. ^ Arellano, Gustavo (January 21, 2010). "Long Beach State Professor Kevin MacDonald Helps Mainstream a New White Supremacist Political Party". OC Weekly. Retrieved January 30, 2016. ^ MacDonald, Kevin. "Understanding Jewish Influence I: Background Traits For Jewish Activism" (PDF). Toqonline.com. Retrieved January 30, 2016. ^ *Kevin MacDonald:Understanding Jewish Influence II: Zionism and the Internal Dynamics of Judaism. TOQonline.com. Retrieved on October 25, 2011. ^ Kevin MacDonald:Understanding Jewish Influence III: Neoconservatism as a Jewish Movement. TOQonline.com. Retrieved on October 25, 2011. ^ Blumenthal, Max. "Republicanizing the Race Card". The Nation. Retrieved October 22, 2016. ^ George Michael. "Professor Kevin MacDonald's Critique of Judaism: Legitimate Scholarship or the Intelleetualization of Anti-Semitism?" (PDF). Kevinmacdonald.net. Retrieved January 30, 2016. ^ Ray Duckler (July 11, 2010). "Candidate: Keep state's complexion white". Concord Monitor. Archived from the original on July 16, 2010. Retrieved July 17, 2010. ^ "John DiStaso's Granite Status: State GOP rejects Ashland NH House candidate as 'despicable racist'". New Hampshire Union-Leader. July 7, 2010. Archived from the original on June 20, 2013. ^ "REPUBLICAN : STATE REPRESENTATIVES : GRAFTON COUNTY" (PDF). Sos.nh.gov. Archived from the original (PDF) on March 4, 2016. Retrieved January 30, 2016. ^ "The National Socialist American Labor Party". N.S.A.L.P. Archived from the original on January 8, 2011. Retrieved February 22, 2013. ^ Office of the California Secretary of State, "County Clerk/Registrar of Voters (CC/ROV) Memorandum #09175," by Deirdre Avent (November 13, 2009 - retrieved on January 13, 2010). ^ "Qualified Political Parties for the General Election". 2010. Archived from the original on September 15, 2010. Retrieved September 28, 2010. ^ "American Third Position Web Page Most-Visited of Any U.S. Political Party". Retrieved January 29, 2016. ^ "News from The Associated Press". Hosted.ap.org. October 5, 2011. Retrieved January 30, 2016. ^ "American Eagle Party Ready to Soar". AmericanFreedomUnion.com. Archived from the original on January 30, 2016. Retrieved January 29, 2016. ^ Ziggler, Jed (March 23, 2015). "Kenn Gividen & Bob Whitaker to Run for President & Vice President for the American Freedom Party". Independent Political Report. Retrieved April 13, 2016. ^ "Kenn Gividen Steps Down as American Freedom Party Presidential Nominee, Bob Whitaker to Take His Place at the Top of the Ticket", Independent Political Report. July 26, 2015. ^ "Bob Whitaker Resigns from American Freedom Party Presidential Ticket". Independent Political Report. April 7, 2016. Retrieved April 7, 2016. ^ "WV SOS - Elections - Election Results - Online Data Services". Apps.sos.wv.gov. October 4, 2011. Retrieved January 30, 2016. ^ West Virginia gubernatorial special election, 2011#cite note-25 West Virginia SOS Elections, accessed November 10, 2012. ^ "2012 Presidential General Election Results" (PDF). Uselectionatlas.org. Retrieved January 30, 2016. ^ Gianluca Mezzofiore (February 1, 2012). "Ron Paul, the American Third Position Party and Stormfront". International Business Times. Retrieved February 4, 2012. ^ "'ANONYMOUS' hits White Supremacist sites". Intelwire. February 1, 2012. Retrieved February 4, 2012.